Early morning above Whatipu – before it really got hot! It’s midnight and I’m slumped on the side of the Te Henga track, overlooking the wild west coast. I’m exhausted. I don’t want to eat. I don’t want to drink. The air is cool but my body radiates an intense heat. I’ve been on the go since 5 a.m. and in those 19 hours I’ve covered almost exactly 100 kms and made some 5,000m of ascent on the legendary Hillary Trail. This answer surprises me because I’m really not a quitter. I’ve been in worse spots before and almost always pulled through. I’m not injured, I’m just tired. Okay, VERY tired. But what’s happened to the voice that normally says “come on Mal, you can do this, just keep putting one foot in front of the other and see it through”? It takes only a few moments more reflection to work it out….. Normally I have a bigger reason for doing these things – a Cause I’m raising money for, or more selfishly I’m in race mode. Or I’m simply just reveling in exploring a new place. None of this applies this time. I realise I’m doing it for no better reason than personal pride. Okay, let’s be brutally honest and give it its real name – Ego. I want to be the first to do this, but I’m only now realising that I don’t want it that badly. I don’t want it enough to struggle on through the night for another 50 kms. Thinking back I realise that I was never particularly excited about this outing. Why? Primarily because there was no adventure in going back over trails that I’ve run countless times; and because there is no Cause that I’m putting myself on the line for. It’s then I comprehend why I am really doing this – it’s because I feel I OUGHT to, not because I WANT to. I realise it’s simply not enough and with that realisation comes an overwhelming sense of calm. Peace. Serenity. I don’t have to tear myself inside out before making the decision final – I am quitting! Such a decision would normally leave me feeling devastated; a failure. But not on this occasion. Instead I feel liberated, cut from the torment of the ‘Need to Succeed’. Now I simply wander on along the overgrown trail, taking my time and rejoicing in the spirit of this wild place. I cease looking at my watch and instead commune with the rich sights and sounds that I would have otherwise missed in my rush to keep on moving as fast as I could. So that’s how it finished, but what of the 19 hours I spent out there believing I was going all the way? Well, I’d come up with a cunning plan. Rather than starting at one end of the Hillary Trail and running it as a simple out-and-back I decided to park my car at Karekare and start from there. This would give me access to much-needed provisions half way through. At 5 a.m. it was barely light as I jogged through the pre-dawn silence of the Pohutakawa Glade, heading south. As I ran along Karekare beach I was treated to a beautiful sunrise. All was good, there was no place I’d rather have been. The trail ahead was well known to me – into the Pararaha, up the Muir, along Gibbons and down into Whatipu. I’d allowed two hours for this but did it running well within myself in 1hr 40 mins. I topped up with water and under a clear, brightening sky started uphill on the Omanawanui Track. There were already signs that it was going to be a scorcher of a day but the southerly breeze was reassuring. I felt strong and confident all the way to Karamatura Forks, down to Huia (using the low tide foreshore route) and on to Arataki. I was some half an hour ahead of my scheduled 6:15 turnaround time and really trying to take it easy as I headed back down the Slip Track. The heat was building and so was my intake of Enduralytes. Food was going down OK, I just had to stay focused on slow and steady, relentless forward motion. Back through Huia, up the dreaded Karamatura Hill with not too much trouble and eventually back to Whatipu, where I really became conscious of how hot the day was getting – it was mid-pm by now and into the high 20’s. But that sweet southerly breeze seemed to be doing its job of fanning me cool – at least until I hit the dunes at the mouth of the Pararaha, where I started to melt. The final stretch into Karekare really took its toll, the combination of soft sand and direct sun drawing way too much from me. I took 20 minutes in the car park to collect myself, change my socks, down some ginger beer and try to get some solid food into me. But neither the roast potatoes or pasta salad that I had on hand wanted to go down. It was a worrying sign, but otherwise I wasn’t feeling too bad. I was still on 28-hour pace and climbed Coman’s confident that I could stay on this schedule. 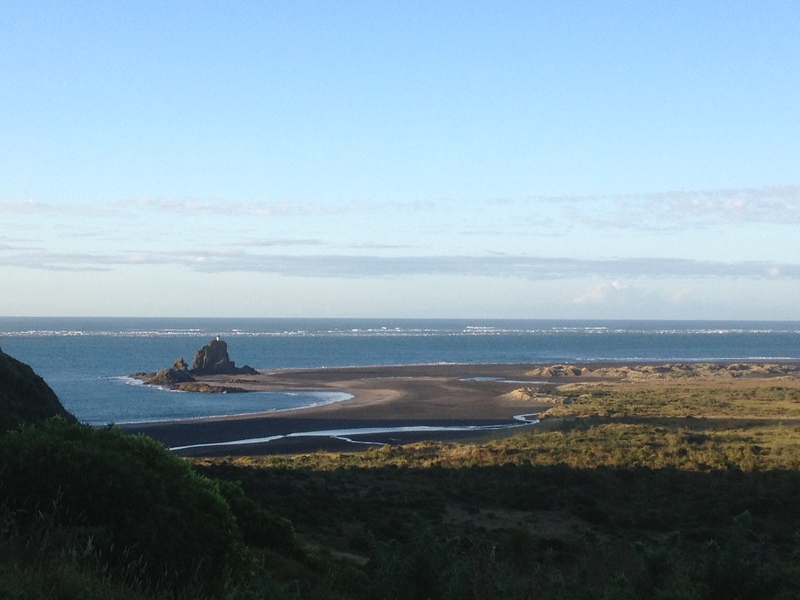 By the time I hit the Piha Road it was well gone 6pm but the heat was still in the air. I was shoveling in water and enduralyte capsules, but could feel exhaustion creeping up on me. I’d been stopping at every stream crossing to pour water over my head and wet my running cap. The temptation to fully immerse myself in Kitekite Falls was immense but I figured that as we were now well into the evening I’d start to cool down anyway. I carried on with just a cursory splash of water to my face. Mistake! I’d planned on 2 hours from Karekare to Piha Surf Club, but for the first time my pace fell behind target. I was hurting big time in the soft sand on Piha Beach and despite it now being almost 8pm I simply couldn’t find any respite from the feeling of being too hot. On the climb up White’s things came to a head. I was suddenly dizzy, swaying all over the place and had to sit down. My shirt felt like it was on fire and I had to rip it off. I tried to think logically about my predicament. I was still peeing, still getting electrolytes in, there’d be a cool breeze again at the top of the climb, and soon it’d be nightfall. I just needed to get up the next 150m of climb without falling off the edge and all would come right. I walked bare chested for the next couple of kms, desperately wanting to feel cool. In the end I found a really windy spot at the start of the Kaituna roller coaster and hung out there until at last I felt a bit cooler. Over the next few kms I coped with the big hills pretty well. Again I was tempted to lie down in the streams, but didn’t. It got dark but in the bush the heat was slow to abate. I got down Houghtons and around Lake Wainamu slowly but steadily, the lure of a stashed bottle of Coke at the start of the Te Henga drawing me on. I was buggered, but I was still moving, still confident of success even though the thought of doing the Te Henga twice at night was enough to make me weep. Very soon after I knew I was in trouble. Despite the fact that it was now almost tomorrow and the southerly breeze was picking up, I still felt hot on the inside and every time I tried to break into a jog I’d get dizzy – not a great thing when running along wild cliff tops at night! Which is how I came to be sitting looking at stars and coming to one of the easiest decisions of my running life – it was over, I simply didn’t want this enough, or for the right reasons, to continue. Except pulling out wasn’t quite so simple. I had another 3 hours of slow walking, punctuated with two attempts at sleeping in the bush (hey, I finally got to use a survival bag!) before I arrived at a deserted Muriwai Beach sometime after 3 a.m. Only then – in fact after waiting another hour – could I put in the call to Sally to please come and get me. In hindsight it was a failure to keep my core body temperature under control that sowed the seed of defeat. But even then I could have battled through had I really wanted to. I didn’t want to. Not enough. And that was the bigger learning – from hereon in I’ll make sure the challenges I pick serve some greater purpose than satisfying my ego. The twin sirens of Cause & Adventure will be my calling. And the company of others, because 24 hours is a long time to be stuck with just me for company! I still love the Hillary Trail and the landscapes it passes through. These places are ingrained in my soul and I’ll always enjoy running the trail in sections, experiencing it in all its beauty and brutality. But I will NOT be going back for another Double attempt. This entry was posted in Great runs and tagged Hillary Trail, Running firsts. Bookmark the permalink. Great effort Mal, but I must say I was shocked by your last sentence. Really? I am really new to off road running and to be fair I am fairly average at it. But I do it because I love it. 2013 was my first year running – I did the inaugral Kaimai Goat, a handful of the Auckland Xterra Series and Finished with the Tongariro Goat – epic! I am going back for more in 2014 and I am sooooo inspired by reading your running posts – you are so honest and it makes me realise that even the “really awesome” guys struggle. It is my aim (one day – maybe next year) to do the Hilary Trail – but I definately will not be able to attempt it twice. Good on you! as a Hilary newbie, that was a great piece of writing. Well done mate!